Jason Statham is the kind of movie actor who has a strong screen presence, you forget who else is with him when he is in shot. But if you ever wondered what a film would be like with a world made up of Jason Stathams might look like, a bit like that scene in Being John Malkovich but with Stathams, then today is your lucky day. 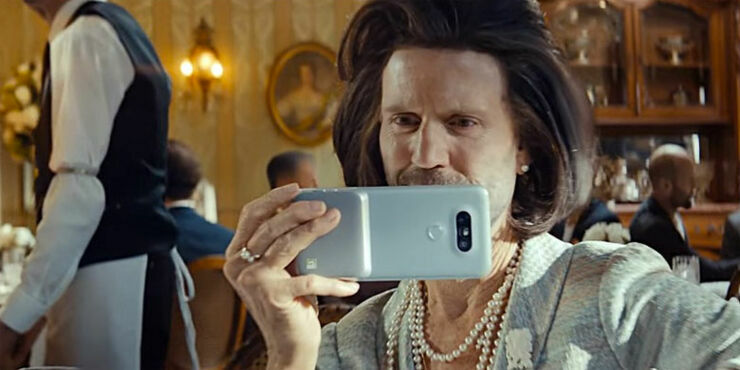 Because a new, very surreal commercial for LG's latest smartphone, the G5, imagines just that. And it's very weird. very weird indeed. It means we get to see Statham, known for his macho action roles in films like Transporter franchise, as a baby, as a woman, well as lots of different women actually, and as a whole variety of other characters too. But, true to his action hero status, we do also get to see him in a fight. A fight with himself, of course. And we get to see him in a riding a herd of bulls while wearing a long-haired wig too. It all adds up to some surreal advertising. And if you were wondering what on earth it has to do with the phone, well, the G5 has a modular design which means you can swap in different accessories, like a camera grip or a digital to analogue audio converter. So that kind of explains all the different Stathams.